hphc_news@hotmail.com -- This is checked once a week during hiking season, and sporadically at other times. Yes, we are on it! Howard Gibson: hgibson@eol.ca -- for a quick response all year. You can get on this mailing list this way too. Fill this in and mail it, with a cheque for $10, to the address on the form. Alternately, you can show up at the hike with the filled out form, and cash or a cheque. The High Park Hiking Club was started about thirty years ago by Nordic skiers from the High Park Ski Club, to provide some activity once ski season had ended. We are also associated with the Toronto Bicycle Club , which used to be the High Park Bicycle Club. We specialize in day trips to trails mostly within an hour and a half drive of Toronto. We hike on the Bruce Trail a lot, but anything interesting between Niagara Falls, Collingwood and Port Hope is possible. This an adult club,not for profit, run entirely by volunteers. 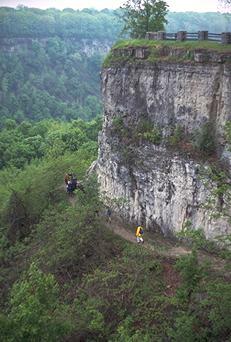 All participants assume all risks involved with hiking. You must be at least eighteen years old to participate. Our mailing address is High Park Hiking Club, 253 Sixth Street, Etobicoke, Ontario. M8V 3A8.